Our AGM was held last Saturday at HMS NELSON with 100 members in attendance. The evening also included prize giving and a dinner in the Wardroom. It was great to see so many members, both serving and ex-serving, present to enjoy the evening. The AGM included the loyal greeting, updates from the Commodore, Chairman and Rear Commodores, an overview of the Association's finances, the election of a new Vice Commodore, 3 Rear Commodores and Hon Chaplain and finally a discussion on transformation. 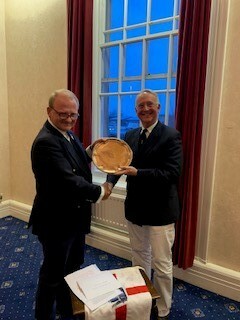 The Trafalgar Room was full overflowing, which provided the perfect backdrop for our Chairman, on behalf of the members, to present Mike Shrives a superb drinks salver made from the actual copper from the hull of HMS FOUDROYANT. Mike's wife Sarah's support was also warmly recognised with the presentation of some theatre tickets. The AGM was followed by the annual prize giving and a relaxed buffet dinner.